Diesen beyden Ehegatten als: \ Peter Bummerschein. \ und seiner ehelichen Hausfrau Maria \ Margaretha gebohrne Ramberger \ ist eine Tochter zur Welt gebohren, \ im Jahr unsers Herrn Jesu, 1829. \ den 18ten Tag Julius \ Diese Tochter ist gebohren in \ Jackson Taunschip Montgomery \ Caunty, in dem Freystaat Ohio \ in Nord Amerika; und erhielt den Namen \ Bäcke [blank] \ Tag [blank] im Jahr unsers Herrn JESU [blank] vom Ehrw. \ Herrn Andreas Henkel. Ich bin getauft, ob ich gleich sterbe, \ Was schadet mir das kühle Grab? \ Ich weiß mein Vaterland und Erbe, \ Das ich bey Gott im Himmel hab’: \ Nach meinem Tod ist mir bereit, \ Des Himmels Freud’ und Feyerkleid. Ich bin getauft, ich steh’ im Bunde, \ Durch meine Tauf mit meinem Gott; \ So sprech’ ich stets mit frohem Munde, \ In Kreutz, in Trübsal, Angst u. Noth. \ Ich bin getauft, deß freu ich mich, \ Die Freude bleibt mir ewiglich. To these two married people, namely Peter Bummerschein and his lawful wife Maria Margaretha, born Ramberger, a daughter was born into the world, in the year of our Lord Jesus 1829, on the 18th day of July. This daughter was born in Jackson Township, Montgomery County, in the free state of Ohio, in North America, and received the name Bäcke [blank] day [blank] in the year [blank] from the honorable Mister Andreas Henkel. The sponsors were Christian Schuder and Eva Christina, his wife. Hand-colored; hand-lettered; printed form. The main text in Fraktur within a rectangular frame is in the center of the document. 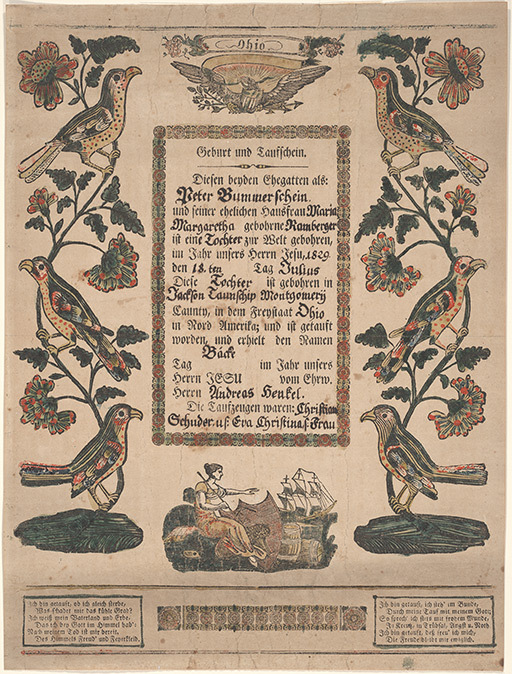 Two verses in Fraktur within rectangular frames are in the lower corners. On each side is a flowery tree with three birds. In the upper center is an eagle behind a shield and with a branch and arrows in its claws. In its beak is a banner. Above it is the word “Ohio” within oval frame with bunches of grapes at its sides. In the lower center is a decorative band. Above it is a sitting woman holding a staff in one hand. To her left is a dwelling, and to her right is a shield with the image of a bushel of wheat. Two barrels and several boxes are next to it. In the background is a sailing vessel. Attribution to printer Wilhelm Gunckel based on a Taufschein with identical bird panel woodcuts that bears his imprint. See Stopp, p. 183. Klaus Stopp, The Printed Birth and Baptismal Certificates of the German Americans (East Berlin, Pa.: Russell D. Earnest Associates, 1999) vol. 5, p. 182.